PENSACOLA, FLA - Forget about burning the cookies and getting sticky with glue. To get in the true holiday spirit, inspired consumers are creating original decorations and gifts using Craft Blocks from Hy-Lite®. 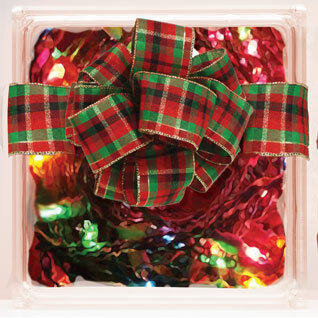 The durable acrylic blocks can be used for interior and exterior holiday projects made by people of all ages. "We've seen people fill the blocks with red and green candies and then put a bow around them for the holidays," says Laura Sikes, marketing and national accounts manager with Hy-Lite, a U.S. Block Windows Company. "You can also add greenery and tinsel inside the block, holiday-themed confetti, or strands of decorative twinkle lights. There are endless ways to create holiday decorations using the Craft Blocks." Sikes also suggests that people --- including children --- can make gifts out of the blocks. "It's simple to create a bank or a memory box using the blocks," says Sikes. "If you're creating a gift for a collector of small items ... like stamps, coins or puzzles, you can fill the block with those items to give as a present. Adding potpourri or scented cinnamon sticks to the blocks creates a fast, easy gift. Or, you can put an assortment of dry dog treats inside the block and add a big paw print and the pet's name on the outside as a gift for an animal lover!"